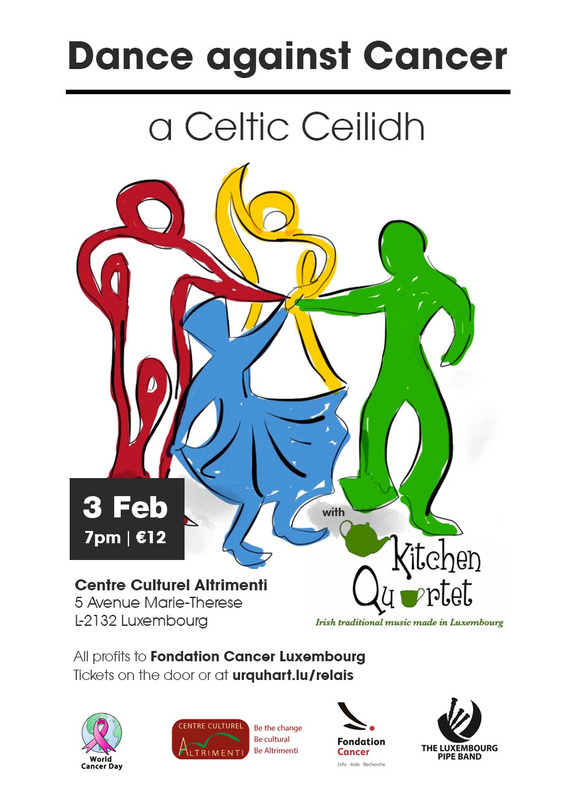 To mark World Cancer Day, and to raise funds for the Luxembourg Cancer Foundation, there will be a Scottish/Irish Cèilidh featuring Kitchen Quartet on 3rd February 2018. The event will take place on 3rd February from 7pm at the Centre Culturel Altrimenti, Centre Convict, 5 avenue Marie-Thérèse, L-2132 Luxembourg. You won’t have to dance, but if you’re keen to try and don’t know how, our experts will help you. There will be a cash bar provided by Altrimenti. All money raised will be donated to the Cancer Foundation. If you’d like to join us, please reserve a ticket.